The night before practice, after a lot of questions and thinking, we realized that I may be ambidextrous. This may seem like no big deal outside of archery, but this could explain issues I have been having when I get tired and my arrow tend to hit to the right of the target. In order to compensate, I need to cover one eye during shooting. This will be the first tournament in which I have done that so I was stressing about it a bit as I went to sleep. Arriving to the practice field I was a little nervous at first because I had to try shooting with sunglasses with one side blocked out. The reason for the sunglasses was because every time I would practice my shots would consistently go right no matter how much I moved my sight so we thought it might be a result of an eye dominance problem. When we got to the field I went to go find a target to set up at and thankfully I had my coach’s help so we could figure out what was going wrong. While I was shooting my coach and I noticed my arrows were more centered so we decided I should give the sunglasses a shot for the tournament. 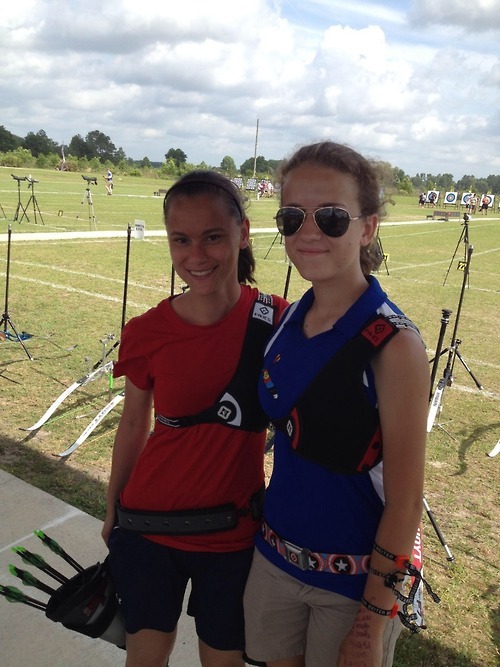 When I got up the day of qualification I was excited to see my friends and interested to see how the sunglasses would work out. 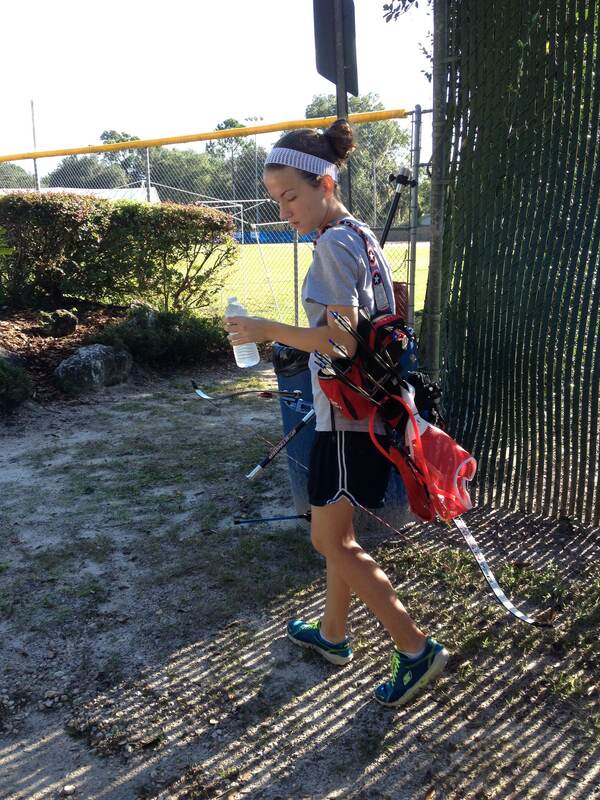 As I was warming up with the 3 practice ends given I felt confident and I was ready to get started. Throughout the tournament my shoulder muscles continued to get more tired because of my previous shoulder injury but I managed to power through and ended up with no misses in a really long time. My scores were 255 and 232. The next morning, I woke and my shoulders were extremely sore but I knew I could get through it. I was bummed out to be sore but I have been unable to exercise the muscles for several months so they were weak. Even though I ended up with two misses (that were just because I dropped my arm and they both landed in the same spot right outside of the 1 ring) I still managed a 232 and a 217. This felt like a win for me because I figured out the issue of going to the right, as well as having sore muscles and no longer any pain. I did not make it to eliminations because my scores were too low but that meant I would get to straight to team rounds, which is my favorite part of the tournament. Team rounds are always fun to me and this time I didn’t know anyone on my team so that meant new friends. One of the girls on my team had never shot team rounds before so we had to help her out and coach her through it she was a little nervous which affected her shooting which was totally fine because team rounds are just for fun and we had fun for sure. Overall, I was happy with what I learned. Once back home, I cranked my limbs up a couple of pounds so that I can strengthen the muscles. I am looking forward to shooting over the fall where I can see the results of the hard work. Finally I feel like I am making progress! I was excited for this tournament because I was ready to see all my friends since I didn’t go to Arizona Cup. When we arrived, the weather was perfect and there was barely any wind, I was ready to shoot! As I began shooting, I noticed my arrows were grouping to the right so I moved my sight because I knew it wasn’t the wind. Then I saw my arrows weren’t as tight as they should be which made me think. I realized that my form was not consistent enough because I wasn’t using my back every time. I worked on fixing that. My score wasn’t where I wanted it to be but I realized things on my own so I consider that a major achievement. 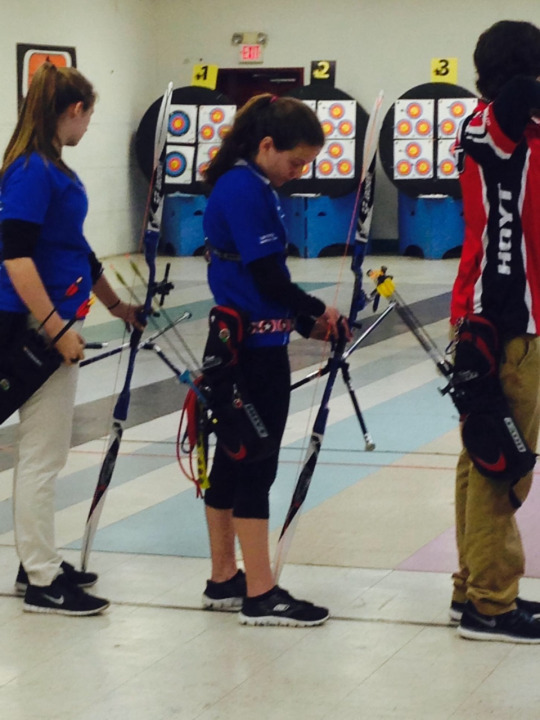 This was a second day of shooting 72 arrows to combine with the first day in order to get a chance to make the Youth World team. I was able to get more sleep and I was feeling good but I realized I had been badly sunburned the day before. My mom had been on me about putting on the sunscreen but I didn’t do it when she said to. I wish I had remembered what happened that year in Arizona and maybe it would have helped me pay attention better. It is hard for sunburn to not be distracting. I shot about the same, talked it over with Kevin, and knew that I have to work on my consistency. When I shoot with the perfect form I have finally figured out for me, I shoot 9s and 10s. It is my goal this year to get better at always remembering that form. I went into the 1/32 round feeling good about it. I like the OR part of tournaments but I still haven’t figured out how to not be overly excited. That is something I have to work on. I had a good time in my match and we went back and forth the whole time. There was a rain delay when we were at 5-3 so we sat for a long time waiting. Once we got started again, I won the match and tied. It came down to us being 5-5, a ONE ARROW SHOOT OFF. Try to stay calm during that? It isn’t easy. My sunburn is blisters at this point and making me miserable. There was ANOTHER rain break for even longer and I really thought that I wouldn’t be able to finish my match. Just when it seemed they would cancel everything entirely, the clouds broke open, the sun came out and we got another chance to finish! We finally got up on the line and were just about to shoot when some of my friends, too many of them, started cheering my name. It was weird. I was trying to stay calm and focus but they made me laugh. 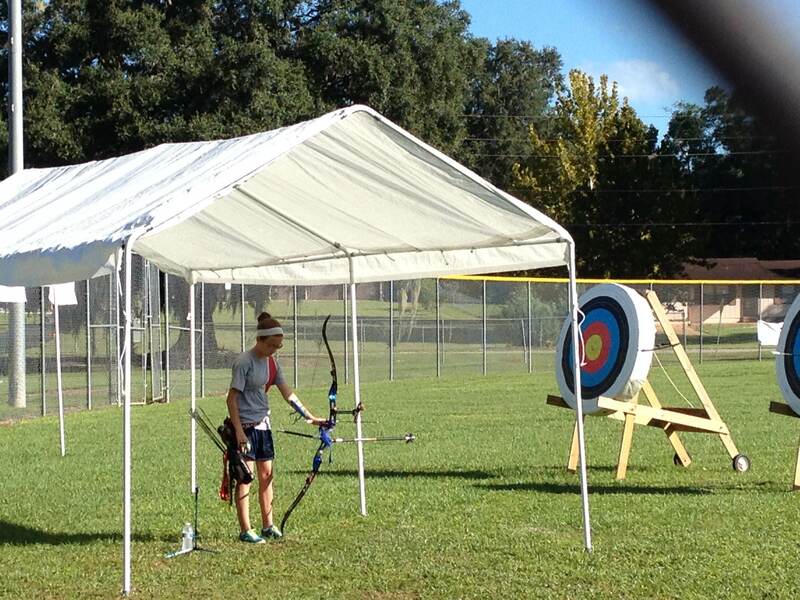 Here I was, two hours after a rain delay, trying to shoot one arrow with blistered sunburn. I couldn’t stop shaking! I finally shot and was too busy trying to drop the bow and see where I shot that I didn’t think about what that was going to do to the arrow. I SHOT A THREE. It was terrible. I didn’t think I had a shot but my opponent did the same thing! When we got to look closer, she had just broken the line into the four. I lost by one stinking point. It was a bummer but also funny. I spent the remainder of the afternoon cheering on the same friends that had done that for me. All together, I accomplished a few things this time around. I know now that I am getting better at self-diagnosing problems. 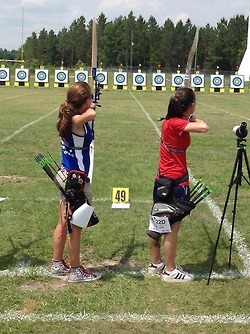 I also know I have to keep trying to get stronger and pull some more weight on my bow, with out sacrificing my form. I know I am on the right track and I have to exercise patience as things come along in their own time. That part is hard. I am looking forward to seeing my friends again this summer at Outdoor Nationals. Hopefully I will see more of you then! I don’t know about where you live but it is HOT here in Florida. I am having to shoot earlier and earlier just so I can get through it relatively comfortably. 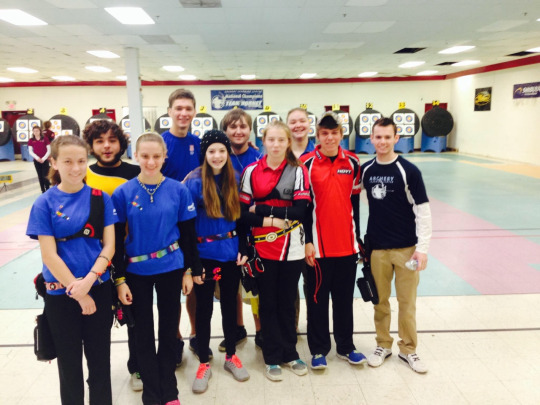 The past two months have flown by with tournaments, finals and now training for Ohio! This might have been my favorite tournament so far only because I didn’t have to travel far and I got to meet one of my Tumblr friends, @juliaarchery ! I got my highest score so far so it felt good to finally be going back up after so many changes. So now I am working on everything and I went down to a lower poundage and up into a better arrow/vane combination for me (I think.) One of the things I have learned in the past couple of years is that what works for one person may not be what works for you. It’s a big learning curve because you may think you are doing fine and then you learn more stuff and its like BAM! I wish I had known everything I know now when I first started! Looking forward to seeing you guys in Ohio and Texas. Who is going? A long time ago, I met Kevin and he showed me how to shoot a bow. It seems like its been forever since I had that first tiny bow. 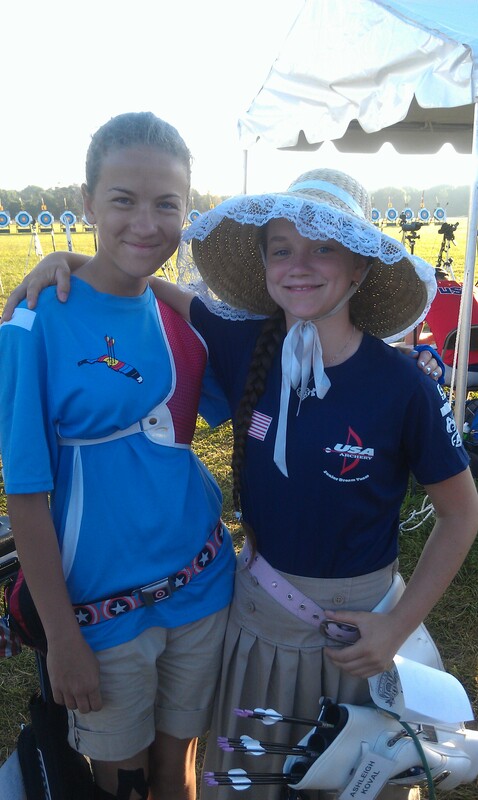 Since then, we have traveled all over the United States competing and having fun at archery tournaments. I feel grateful for him introducing me to archery but I really feel grateful that he went to war and made it back. Today, you should take the time to remember the Veterans that made it back and those that did not. Thank them, hug them, support them. If you are looking for a good place to donate, Operation Homefront is responsible for making sure we had a home. I have a new Five Questions and its with an Olympian! Butch Johnson has competed in five Olympics, isn’t that so cool? I hope you learn something from him today, I know I did! 1. You have been a successful shooter for much longer than most. 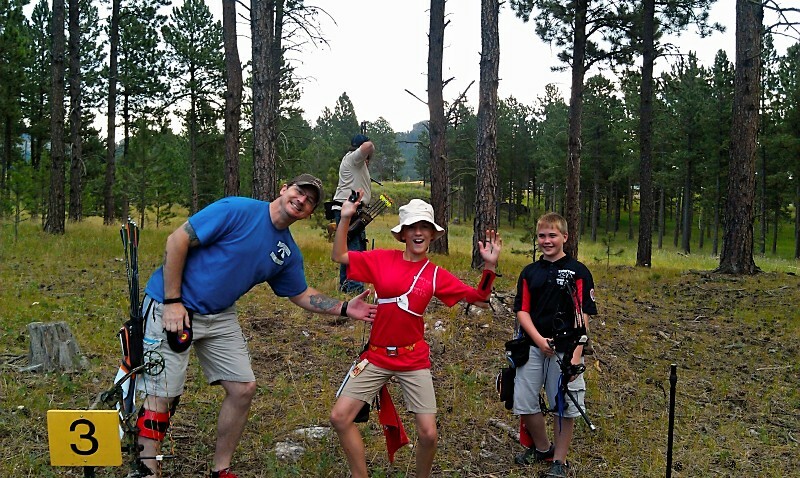 What are the top three things that you credit to your successful archery career? I would say, first, love for the sport. I still enjoy archery, it’s still fun for me. If it stopped being fun, I’d stop shooting, but I still enjoy practicing and competing. Second, a willingness to practice. Without the willingness to put the time in, it would be hard for anyone to be competitive. And third, having a place to practice and a work schedule that allows me the time to train. 2. 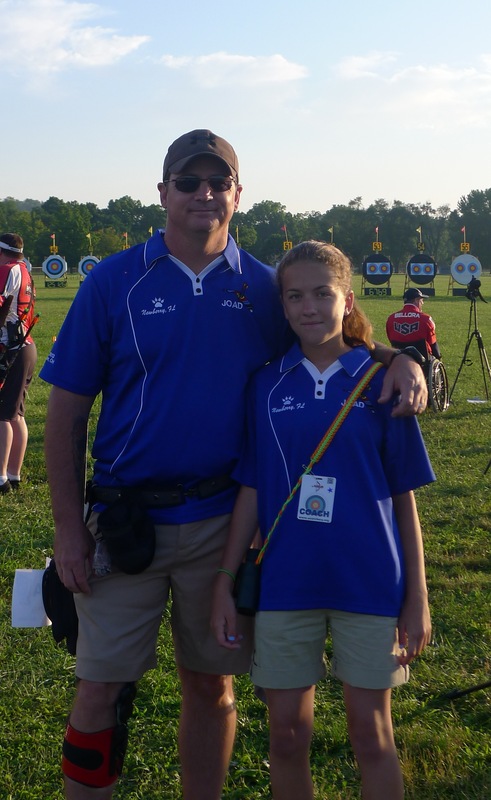 What things have you noticed that have significantly changed in archery since your first Olympics? The main thing I’ve noticed is that the world has gotten better. Yes, equipment has improved in some ways and technology has benefited the sport, but in general, more countries have invested more money into training athletes and growing the sport. This is resulting in countries that were completely not competitive twenty years ago being a major challenge now. 3. What kind of equipment do you use? What advantages do you feel you get from it? Currently, I’m shooting a Win & Win Inno Max riser at 27”, with Win & Win EX Power limbs. I am using Easton X10 arrows, and have been shooting Sure-Loc sights for many years. My stabilizer setup is Doinker Estremos, and I am using BCY string. The best advantages anyone can get from their equipment come when they take the time to experiment – but only if they are shooting consistent groups to begin with. If the archer is shooting well enough to see a consistent group in the target, then small changes – bowstring material, number of strands, type of nock, point weight, etc. can potentially help improve the groups. But the archer has to be shooting consistently well enough first to notice the difference. 4. Do you think the technology advances in equipment have created better shooters or do you think it is still about mastery of the ideal form? I do think it’s about mastering the form. At international competitions, you see many archers who are not necessarily using the latest and greatest bows but still shooting top scores versus the best archers in the world. In fact, many of today’s high end risers still have a lot in common with the best designs from ten plus years ago. 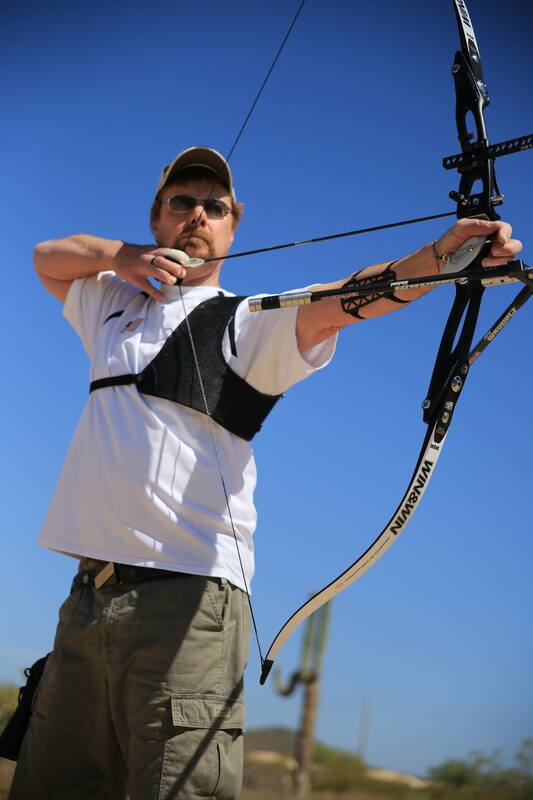 In coaching, I see many archers who try to upgrade equipment, thinking it will make a huge difference in scores, but the reality is that perfecting the shooting form – which only comes from thoughtful and consistent practice – is what makes the scores. Equipment changes help, but only so much. Basically, I try to only focus on what is within my own control. For example, lots of people shoot elimination matches while thinking about their opponent’s scores. I try instead to only focus on the arrow that’s on my bow at that very moment. If you start thinking about your opponent, the weather, how you’re feeling, etc. you can become very distracted very quickly. Some people read, or listen to music between ends, and that helps them. For me, I really just try to keep my head in the game, take one step at a time, keep my mind clear, and focus on making good strong shots. 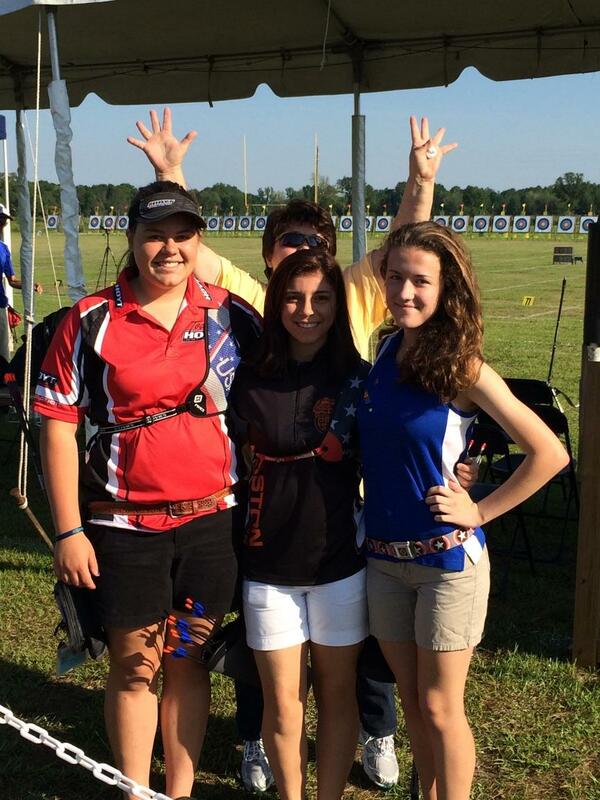 JOAD Outdoor-My week in Ohio! WOW what a week! There was so much to see and learn. As we drove up to the field I was so excited that I had actually arrived. Then as I started unpacking my stuff from the car I realized I left my glasses in the room! So as we were walking down to the practice side of the field I tried to think of where I left them, but I couldn’t so I just let it go. 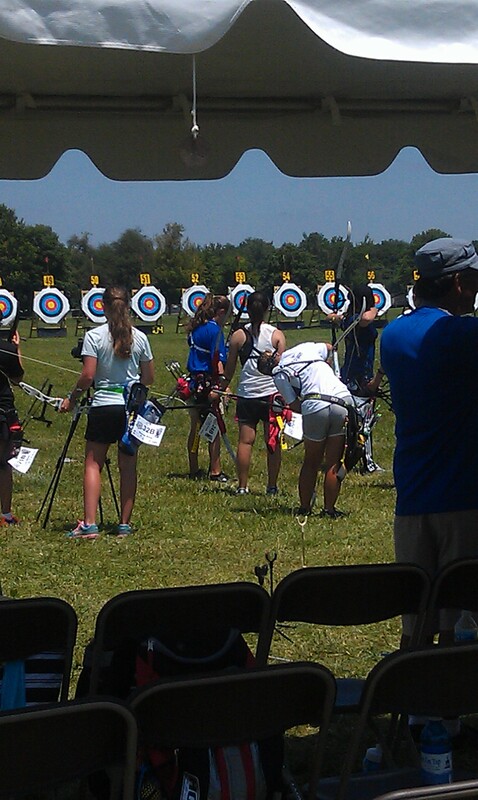 When we finally reached the practice side and I started putting my bow together I saw friends and talked to them. 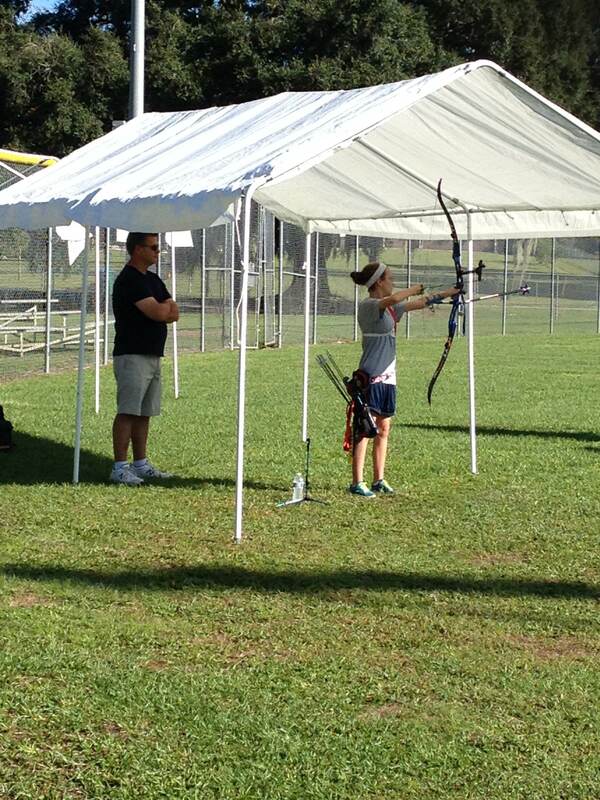 After I got my bow together I went over to a target and started to shoot. As I shot more and more, a lot of people started to show up and take up bales at 60m, because there was only 3. So they moved 1 more up but it still didn’t help; because there were at least four lines and not enough time. So I only got to shoot 50 arrows and eventually went back to the hotel and found my glasses. I also discovered that I had put my limbs on upside down. Funny, right? We agreed we would change them around the next morning. We arrived at the field I had remembered my glasses AND my limbs were on the right way. I WAS READY TO SHOOT! As time passed, more of my friends showed up and decided to shoot with me. When I was done shooting, I put every arrow in the blue and in which was my goal for 60m this year, so YEAH! I felt ready for the tournament. I arrived at the field confident because of my shooting the days before. As I put my bow and toolbox by my bale, I got to meet the people I was shooting with. On my bale I had a team member from the Chinese Taipei team. It was so cool watching them go through their shot sequence and seeing that their shots were so consistent. It was also cool that I go to trade a pin with here and get a Taiwan pin. I started shooting and was low and got easily discouraged. I moved my sight down and shot level so that made me feel better. At the end of the first 36, the majority of problems were from dropping my arm. I even missed and shot below the target. I sat down and drank some water and shot a higher score at the end of the second 36 arrows. At the end of the day, I scored a 220 and a 234. As I was approaching the field the second day I felt confident because I knew what when wrong with my low arrows so I could fix it, or try. Since I shot in the morning the second day, there was a lot less wind. When I started shooting I kept in mind to keep my arm up and I shot high because I moved my sight. I realized now that the previous day I was low because I was dropping my arm! 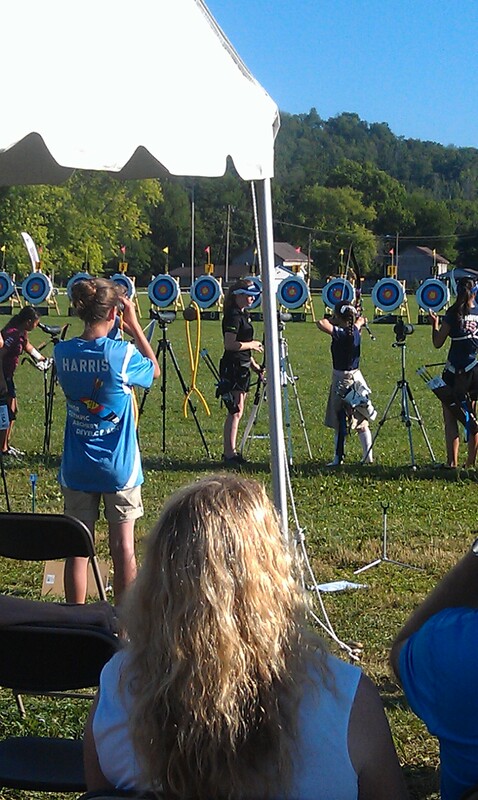 After I shot an end and was consistently high, I moved my sight back to where it was and put three arrows in the gold. I shot three in the gold and automatically was so excited and I was ready to start scoring. I shot 2 more practice ends then it was time to score. As we scored the first end I had no arrows outside of the blue. I was shooting everything in my form felt good; then the wind picked up and was blowing against me and my front follow through wasn’t good two shots in a row. I got two 4s low in the 6th end. After the 4s I got discouraged but then I realized that they were my only 2 out of the blue so far. I tried to keep a positive outlook on it through the rest of the day and only ended up with 5 out of the blue that day. At the end of the day, I shot a 257 the first 36 and a 269 the second 36. I improved throughout the tournament a lot because Coach Diane was able to be there with me throughout the tournament and help me think things through more quickly. Since my form was broken down completely in January and then again in March at JDT camp, this was the first time I was able to get back up to the 260-270s I was shooting before. It has taken so long but I am glad to know that I have the tools for the proper form and I am finally going back up! 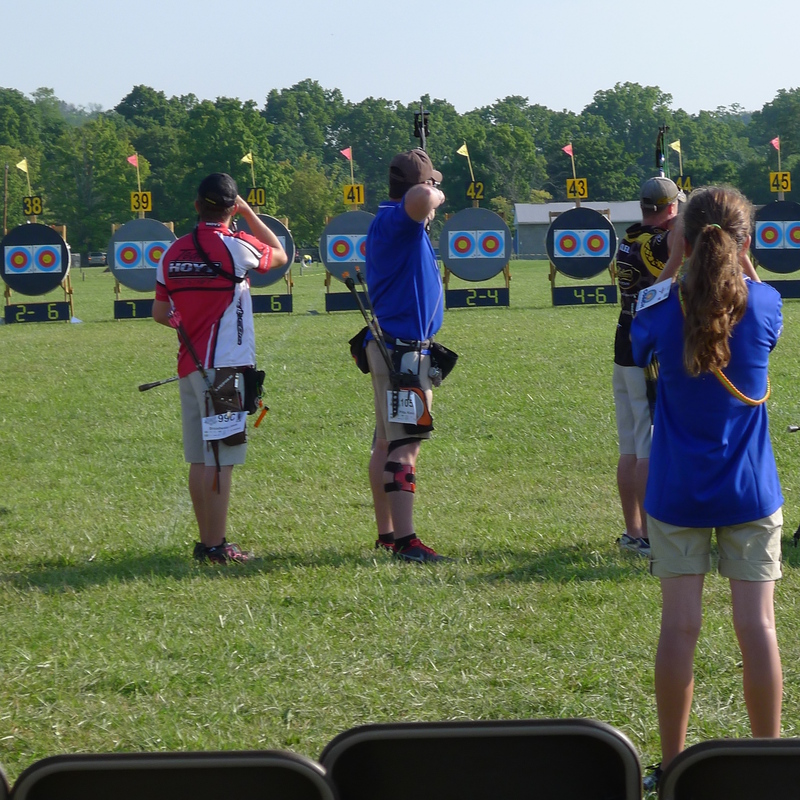 I ended up 40th out of 70th, not the best but I shot my personal best for a FITA round so I am still happy with my second day improvements. In the morning I didn’t have to shoot but Compound Kevin did so I went along and coached him. Up first was the 1/32 round and the wind was blowing consistently left and that’s where they were hitting. I told him to watch the wind and it worked! He shot an X! It was so much fun coaching him and he won his first match and advanced to shoot against Jesse Broadwater, a pro and really, really good compound shooter. I thought Kevin would be really nervous, and he was a little, but not as much as I thought. He shot really well (all red and in) but Jesse shot better by about 15 points so Kevin did not advance to the 3rd round. He shot well though and I was proud of him. After he was done we went back to the hotel and I rested until it was time to go back for my team round. When we went back to the field, I had no idea who was on my team so it was a surprise. Mom went to check while I put my bow together and it turned out I was placed on a team with a girl from my old archery club and one that was right above me in placement. My team worked well together and we shot an end where we each shot a 5 and then a 10 in that order. We got all excited that we were ahead by 20 and then the last end we all dropped our arms and shot 4s and below. We lost and didn’t move on but we had so much FUN. I shot in the morning and my mom checked who I was shooting against and it was Ashleigh Koval and she is on the Junior Dream Team. I was a little worried but decided I would just step up my game. I stepped up to the line she was there too and she is so nice! She is also left-handed so we shot face to face. We started scoring and two points went on the board for me so I thought it was just a lucky end. We shot another and I won the set again so it was 4-0. I couldn’t believe it. I got excited. The next one passed and she won which put us at 4-2. The next round we tied and it was 5-3, then another she won which put us at 5-5. I was taking her to a one-arrow shoot off! I got so excited and I didn’t breath, dropped my arm and forgot to aim off for the wind. Ashleigh won and advanced. She didn’t have a spotting scope so I went to spot for her. She did really well but her competitor won. I had so much fun shooting with her and spotting for her. 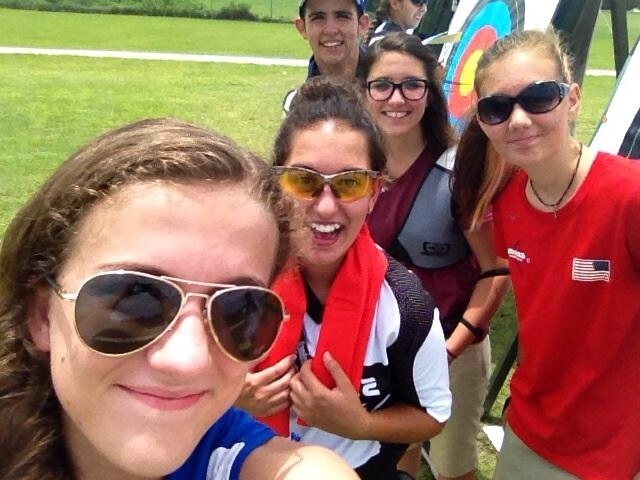 The tournament was so much fun and if you are reading this thinking “Hey, I want to try archery!” I recommend the Outdoor Nationals. It was a LONG tournament but it was so much fun because we had time to enjoy each round instead of rushing through them. 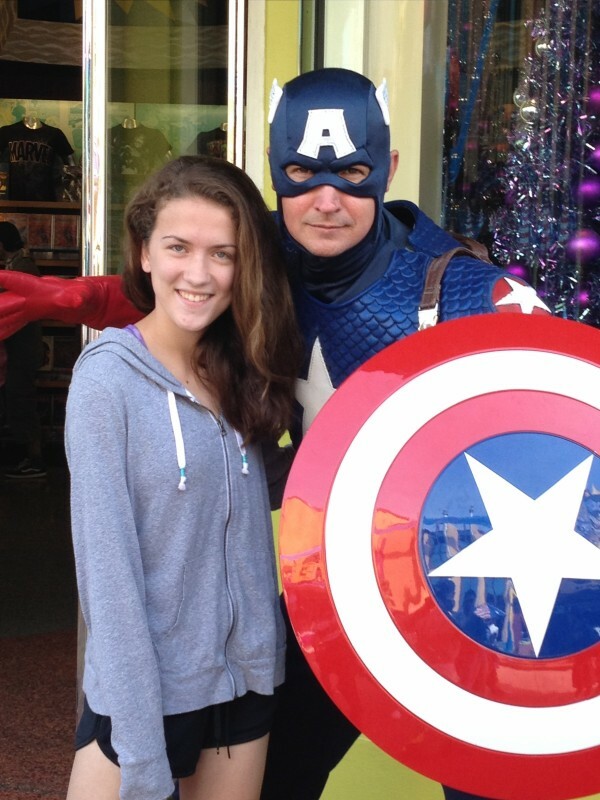 So, awesome news…I AM MOVING TO FLORIDA! I changed my background to the beach scene to celebrate. I am very excited because this will allow me to work outside all year round. 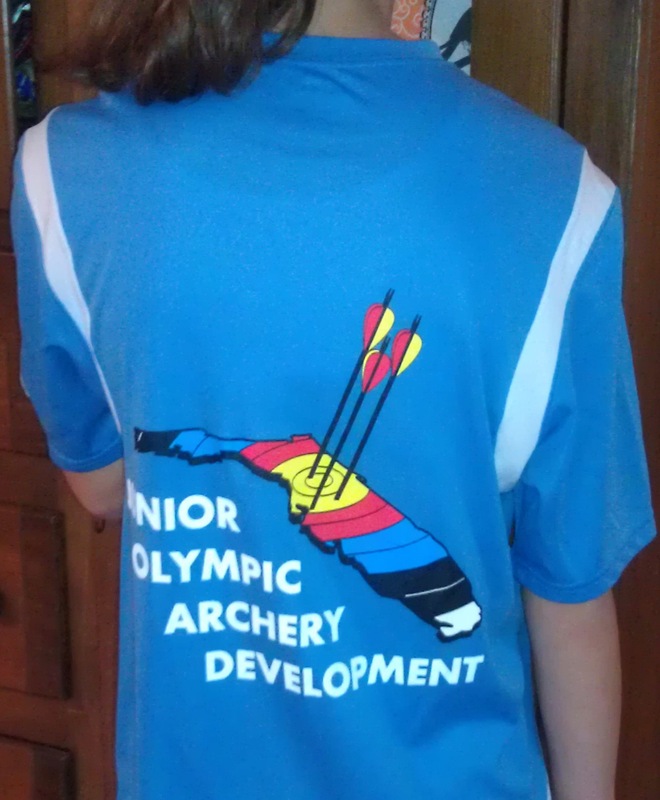 I will be shooting with Newberry JOAD and I took a picture so you can see the cool shooter shirts they have. It will have my last name on the back in a couple of days so please make sure to say “HI” if you see me at a tournament! I have some friends in the club already and my JDT coach, Diane Watson, works with them in person every month so it will be awesome to see her more frequently!